It is oftentimes quite hard to determine what things need to be gotten from the store, and especially in the case of things like milk, it is good to have some preemptive warning before things expire. 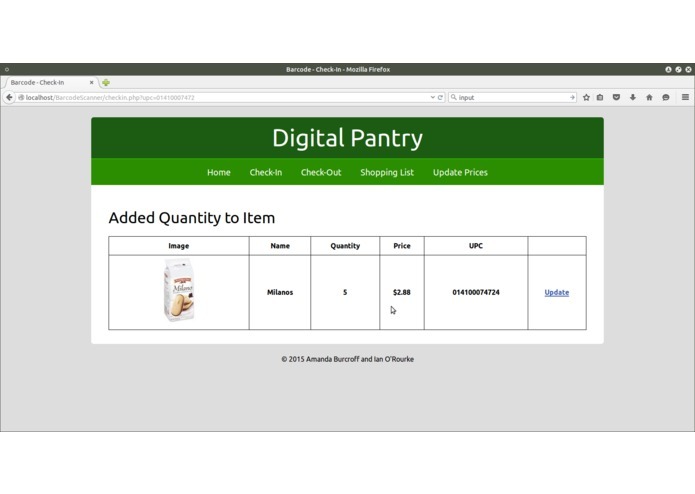 Digital Pantry is designed to automatically notify you about things like expiration dates, and it will even create a shopping list of items to get from the store that are running low. The application is designed to be a dynamic inventory and grocery list generator for home use. 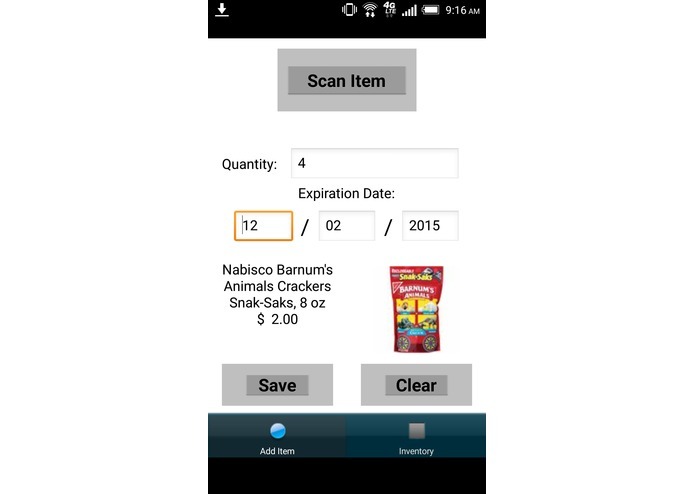 Users can choose to scan in items with a smartphone/tablet and manually enter information such as quantity or expiration date. The application will then generate a grocery list, use the Walmart API to find the prices of items on the list to anticipate the shopping list cost, and notify the user when an item has been used up or is expired. Online Storage of Pantry Items: Keep track of everything that comes in and out of your pantry, all at the click of a button! Can’t remember how many eggs are left? Not sure if you have powdered sugar for the new recipe you want to try? This will ensure that you always know what you have on hand, whether you are at home or on the go. Barcode Scanner: Rather than typing out all the tedious information about every product you bring into the house, just quickly scan the barcode and let us do the work for you! If you are like us and have a spare barcode scanner lying around, you can use that, or the app can use the camera on your phone to do your barcode scanning. 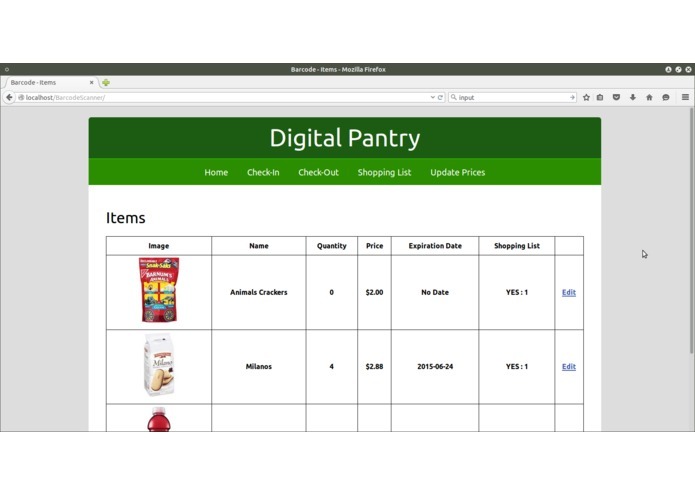 Digital Pantry interfaces with the Walmart Product API to gather data on product name, size, price, and images to save you time and effort. Shopping List Generator: One of the most dreaded tasks of grocery shopping is making the grocery list, with every family member liking different things and never knowing whether there is a secret stash of flour hidden in the basement. Say goodbye to that nudging feeling that you are always forgetting something with the Digital Pantry! It will automatically generate a shopping list for you that will update as items are added/removed from your inventory, so you will know to get more milk as soon as it is gone. Shopping Budget: You can quickly find out exactly how much your shopping trip will cost before you even leave your house. 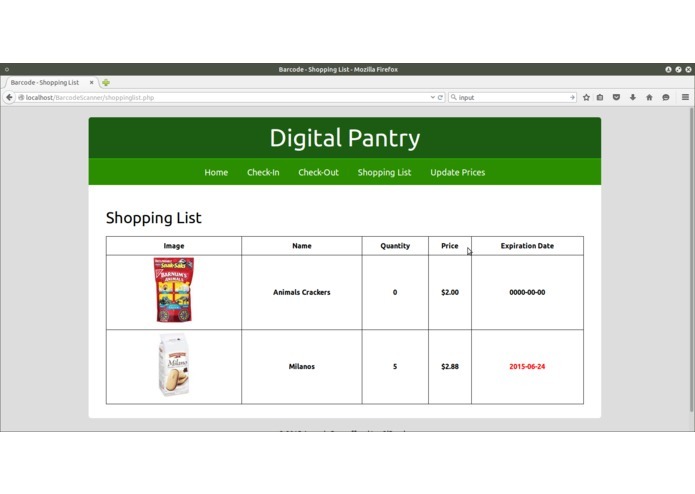 The Digital Pantry will gather the latest data on item prices and calculate the cost of your shopping list. This way you will know how much money to bring, what to expect at the checkout line, and whether you have enough to buy a chocolate bar to reward you for your efforts. Expiration Notifications: Never drink sour milk again! 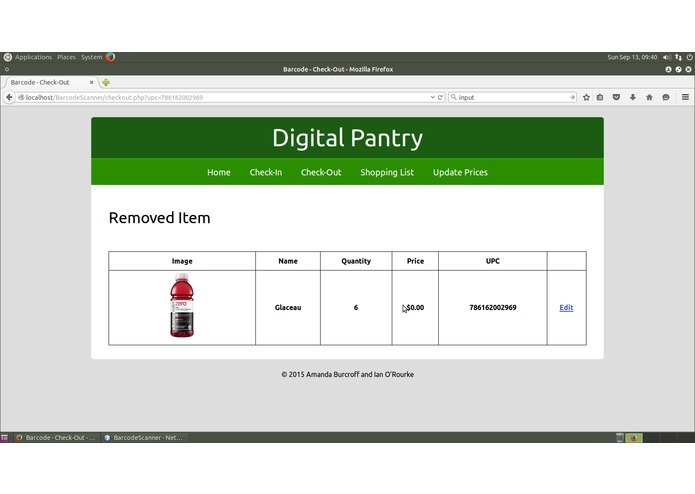 Digital Pantry will alert you the day before your items expire so that you will know to get a replacement. 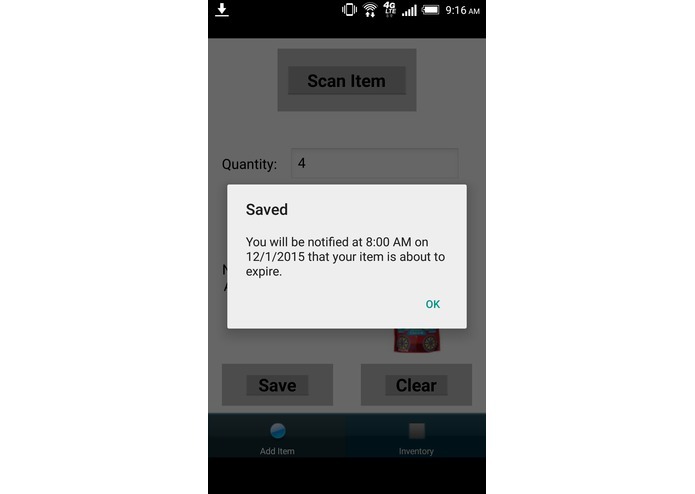 It will even automatically add the item to your shopping list after the expiration date. Adding expiration dates to your items in your digital pantry is completely optional, so feel free to skip this step if you don’t mind sour milk. We built Digital Pantry using a mixture of the Corona Framworks for mobile applications and using PHP, HTML, and MySQL. The Corona Framework is a good platform for prototyping mobile application ideas, and as a result was a good platform to build upon for the mobile application. 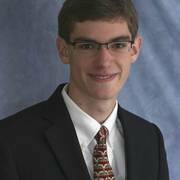 The server and web interface was built using PHP, HTML, and CSS. This ensured that the application could be migrated to nearly any server and still be able to function as expected. One of the biggest challenges was simply getting products to scan properly. The hardware barcode scanner we were using took some time to figure out how to set up to start entering the UPC codes. Furthermore, the mobile application gave us quite a bit of trouble for scanning the UPC codes, too. I worked on the backend of the server and the frontend of the web interface. I created the mobile app in Corona SDK to allow for mobile barcode scanning and to interface with the database as well as Walmart's API.